Mariena Mercer is a booze-bestowing buzzsaw, lovingly lavishing libations on eager imbibers and cocktail neophytes alike. 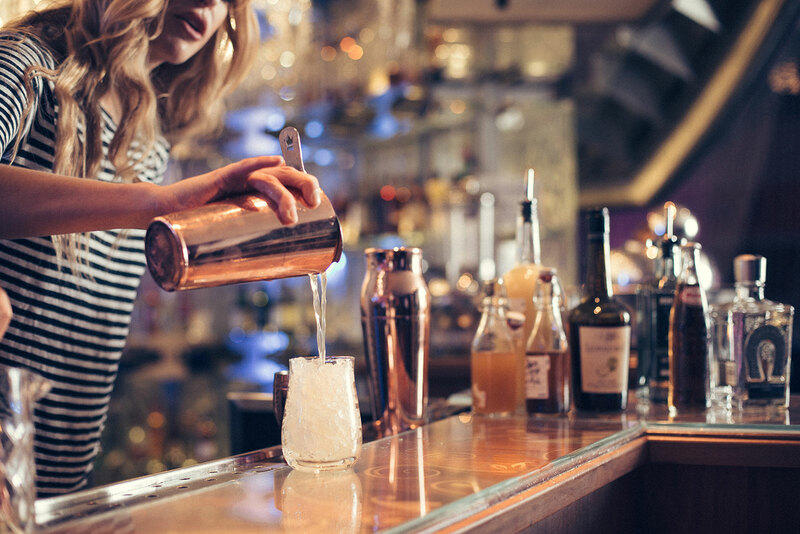 As the head mixologist at The Cosmopolitan of Las Vegas, Mercer controls what gently caresses your liver night after night at Vesper, Bond, The Henry, Boulevard Pool, Wicked Spoon and three-story beating heart of the resort, The Chandelier. It’s a stretch to only the driest, most dismal of alcohol abstainers to say that Mercer is the most important person on property. When the cocktail revolution started in earnest in the early Aughts, the focus was on the classics–your Manhattans, your gimlets, your Frenches 75 and whatnot–but as the movement evolved, products evolved with it. More thoughtful spirits arrived, and companies sprang up specializing in bitters or offbeat garnishes. Infusions were big for a time, and premixed, barrel-aged cocktails can be found on back bars across the country wherever Edison bulbs meet exposed pipes. Never one to follow the curly mustache-and-arm-gartered Pied Pipers of the mixology world, Mercer’s approach of using offbeat ingredients (the first Chandelier menu featured the Verbena, which used a Sichuan flower “buzz bomb” that kicked your salivary glands into overdrive) and oblique spirits is what the rest of the cocktail world is waking up to in 2017. On top of small-batch craft spirits and funky hybrids, the little-loved ugly ducklings of yesteryear are starting to blossom as the beautiful cocktail swans of today. Mezcal, in particular, is creeping into the highballs of adventurous drinkers who want to hit that sweet spot between Islay Scotch and Tequila. Those trends all come together in one glass in Mercer’s Raisin’g Hell, from the just-refreshed cocktail menu at Vesper Bar. It’s a play on a 1940s classic, the El Diablo, which blends tequila with creme de cassis and ginger beer. Mercer’s riff uses Herradura Ultra Tequila, Montelobos mezcal, Leopold apple liqueur, lemon, apple soda and a house-made spiced raisin syrup in place of the cassis. The Petting Party, also on the new Vesper menu, digs even deeper into the wide world of weird spirits to play with Whistling Andy Hopshnop. And yes, that’s a hops-flavored schnapps, for the imbiber who doesn’t want to stop drinking IPAs, even while they’re drinking cocktails. That drink works off the Savoy Hotel’s 1925 Hanky Panky by building a base of Amaro Nonino and oloroso sherry, and adding pear eau de vie and Hopshnop. The latter lends a signature earthiness that plays with the herbaceous base. Speaking of sherry, if Mercer has her way, that’s the next frontier that mixologists will conquer. It’s already something she sneaks into several drinks on her menus across The Cosmopolitan, and it’s one she thinks people will come around to with exposure—once they get past that initial trepidation of a potable that hasn’t been extremely popular in years. Intriguing and hip, subtle and cool, the mix of Las Vegas bars at The Cosmopolitan serves your every whim.